Use the control panel above or the link below to hear 44871 passing through Woodsmoor. 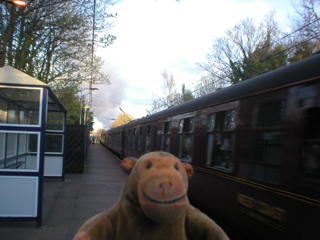 Mr Monkey had enjoyed watching the Buxton Spa Express speed through Woodsmoor station in March, so he kept pestering Mr Rik to check the UK Steam Info website, just in case anyone was going to do it again. On Saturday 2nd April he was delighted to find that a train called the Cheshireman had decided to come through Woodsmoor on the way back to Cleethorpes from Chester. It was going to be hauled by Stanier Class 5 4-6-0 44871, which was one of the locomotives that had pulled the Buxton Spa Express. Mr Monkey decided he had no objection to seeing the same locomotive twice. In the evening Mr Monkey's humans took him to the station, and, for a change, waited on the Buxton platform. There were a few people there already, and more arrived as he waited. First he heard a whistle in the distance, then he saw a small, bright, light at Davenport station. The light got bigger as it got nearer, and then Mr Monkey could hear the sound of a steam engine. 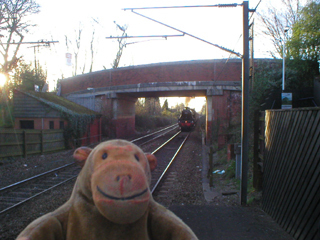 The sound got louder and louder, even while Mr Monkey couldn't quite see the train. Suddenly the locomotive was very visible; moments later clouds of smoke billowed around the bridge and 44871 wooshed past Mr Monkey. The locomotive speedily vanished, but the carriages took longer to pass (probably because there were lots of them, not because they were going slower than the locomotive hauling them, obviously). Mr Monkey did notice that the tender of 44871 was so polished that it reflected a lovely view of the shelter on the platform. 44871 was designed for the London, Midland and Scottish Railway by William Stanier, and built as No. 4871 in 1945 at Crewe. It is a standard Class 5 4-6-0 with a domed boiler, Walschaerts valve gearing and plain bearings. It was renumbered 44871 after the railways were nationalized and remained in service until 1968, when British Rail stopped using steam engines.